So I definitely understand those who have to deal with larger kidney stones, that they most be in some fierce ache. Brr. Hope I don’t ever get this again. So for now I’m alive and well and it feels good to have had the whole Sunday, without any pain. So I hope it will continue like this. Other than being in pain not much has happened, since I haven’t really been in the mood for anything. But yesterday I started The Witcher 3: Wild Hunt, me trying a WRPG. Let’s see how this goes, but so far it is actually pretty okay. We’ll see if it last though the whole game or if I quit if I don’t like it. I might put it in the shelf either way if Onechanbara Z2 chaos arrives next week, I only focus at one game at a time. The environments in Witcher 3 are phenomenal, it really beautiful. 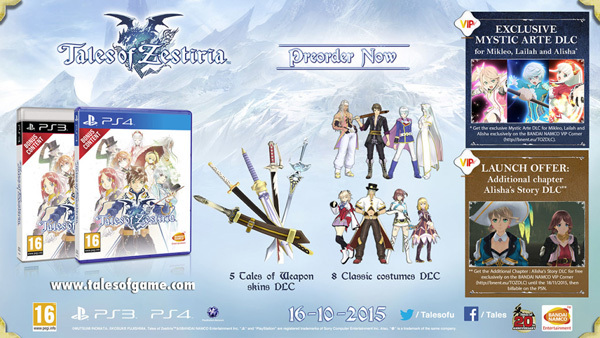 Finally got around to preorder Tales of Zestiria too, can hardly wait until October now. I want this game now! I’ve seen Ant-man and I like it a lot. A fun movie, without a doubt my favorite movie with Paul Rudd. One of the better movies I’ve watched in some time I might say, or rather that entertained me. Now I’m waiting for all the goodie comic book movies of 2016 to have their premiers, next year will be a wonder year for comic book movie fans. Looking forward to it. I’ve also check out a new apartment, it felt new, it felt fresh and it’s close to just about everything. I really hope I get it. Hopefully I get an answer early August if I get it, then I need to really keep a tight lid on any cash I have. Moving is not cheap, with all extra costs here and there. But in the long run I’m positive it is worth it. PlayStation 4. Such a great game, I had some troubles putting the controller down. Like yesterday I played for about 15hours straight! Well I took miniature pauses for food and other visits, if ya get my drift. The worst (best) part is that it didn’t feel like I spent such a long time with the game, the day just flew by and I haven’t done gaming in one sitting like this in years! Mostly I’ve just gotten 2-3hours in one sitting. I did really like the game, but I’m a tad sad that the batmobile takes up a bit too much space. I can’t go into detail on what exactly what I mean, since I would then have to spoil some stuff and I’m NOT going to do that. All in all it was a good game and a good ending to Rocksteady’s Arkham trilogy, I’m please that Rocksteady acknowledges the stuff that happened in Arkham Origins even if they didn’t make the game themselves. 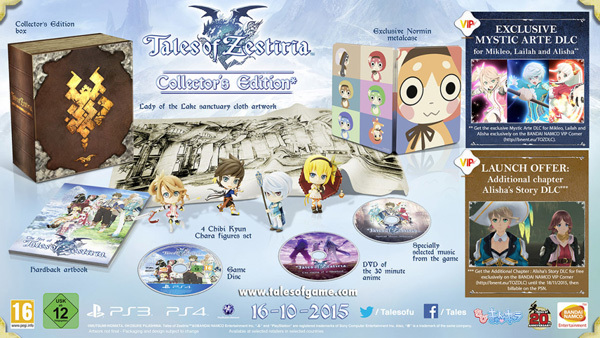 Tales of Zestiria, it’s more or less the same version as the Japanese CE. A shame that the will bring the ToZ OVA over, but on a DVD. You would think they would put it on a blu-ray for the PS3 and PS4. You’ll get a cloth artwork, steelbook, 4 Chibi Kyun figures, hardcover arbook, selected soundtrack cd and a big old box to put everything in. I’m still thinking about getting this or not, some great stuff, but I would have preferred a figure like Milla or Ludger from Tales of Xillia 1 & 2. Some retailers will offer some Tales of Cameo costumes! I need them, I must have them! So hopefully my local GameStop will be able to offer these costumes. If you get the game digitally you will get them regardless. I’m not sure if this is true even for the steam version of the game, but I would be surprised if you didn’t get them there too. And speaking of steam, they are going to release Tales of Symphonia HD on steam next year. If a lot of people preorder Tales of Zestiria on steam and they hit a certain mark, those who preordered ToZ will get ToSHD for free. Not bad, not bad. Onechanbara Z2 Chaos which is coming out the Juli 21 in the US. Guess it will be imported since we still don’t have a date in Europe and I want to be sure to get a physical copy. After that its time for Metal Gear Solid V: The Phantom Pain in September, then in October I have no idea how I’m going to find time to play all the games I want. Dragon Quest Heroes, Tales of Zestiria, Transformers: Devastation. Ugh. Uncharted: The Nathan Drake Collection is something I’ll be getting later, since I do not have the time and I’m pretty sure it will sell well either way. There are probably so many more games I’ve missed and for now that is okay, I don’t need to remember them all. That would only be more trouble for me. Hehe.